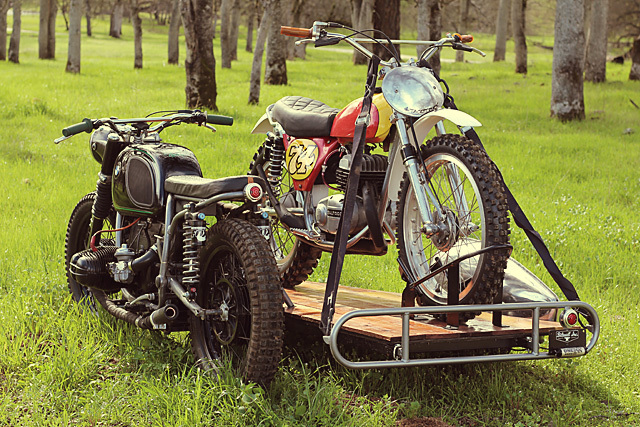 Sit around a table, hang out in a workshop or share a beer with a group of custom bike fanatics and one question is guaranteed to come up every single time, “what if?” What if we jammed a Triumph engine in a Norton frame, what if we stuck my Gixxer forks on your old CB Honda or what if we, follow me here guys, we turned a Hyosung into a race bike? Ok, so clearly some ideas are best forgotten, others have gone on to become legendary innovations and the vast bulk never see the light of day. 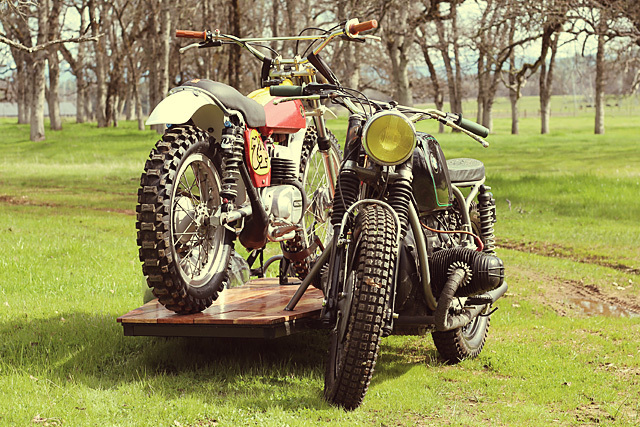 But when Craig Marleau of Kick Start Garage in Northern California had such a moment he not only built his “what if” idea, The Taco Truck, he completed it in record time, pulled off a creation the likes of which has never been seen and won an award at the prestigious One Moto Show. 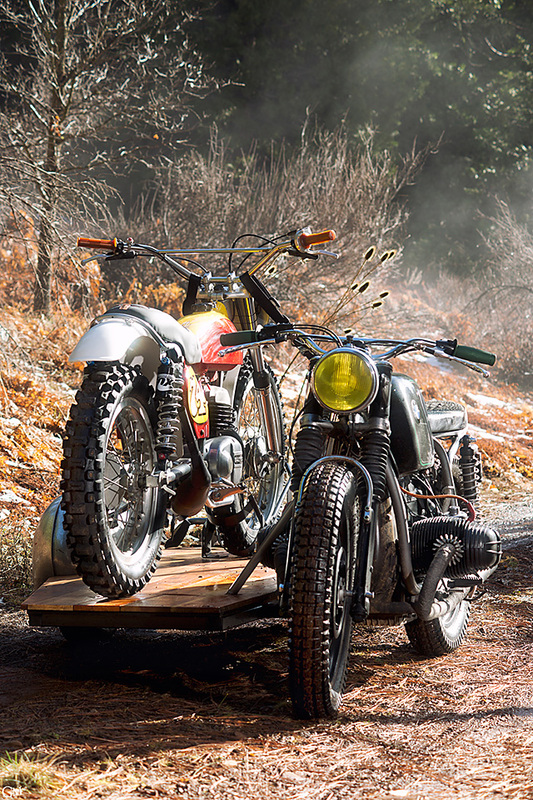 “From timeless restorations to trend-setting customs, Kick Start Garage is truly a craftsman’s moto works!” and this build is proof positive the motto matches the man! 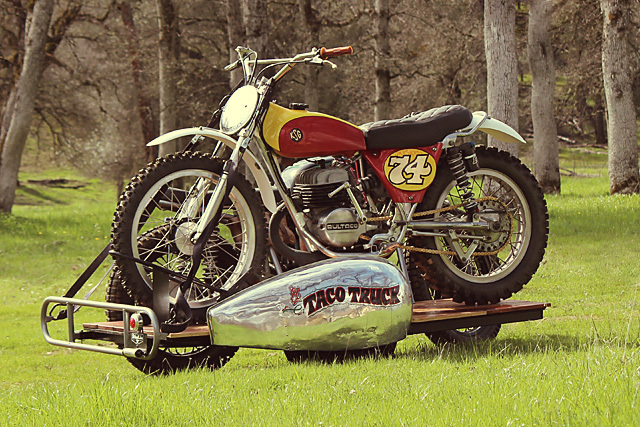 The Taco Truck started from this idea – “what if you could jump on your vintage motorcycle and ride to a vintage MX race and be able to then throw your leg over a race bike and have fun? 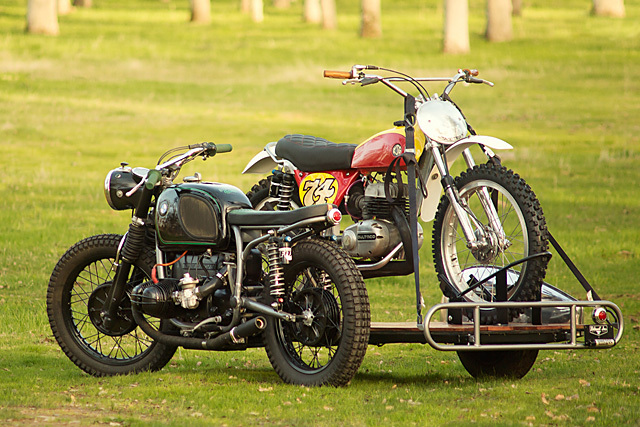 The trouble is, you would need to ride someone else’s bike or have it brought to the track for you. 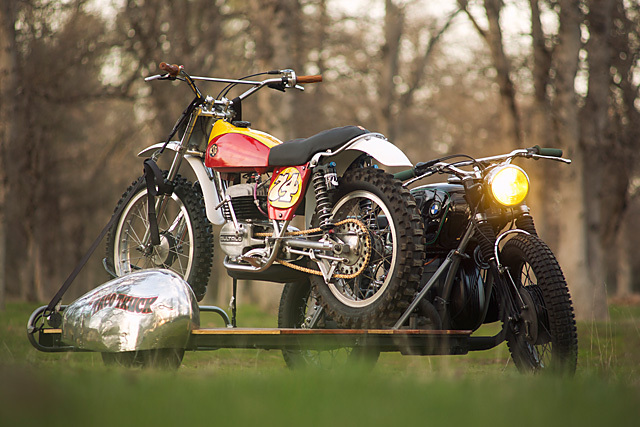 So why not ride to the track and bring your race bike too?” Genius, It all gets going with the custom tow vehicle a 1971 BMW R75/5 that has been given the full Kick Start treatment. Stripped back to the bare frame it was relieved of all the bits and pieces it didn’t need and the rear subframe was removed. Wanting there to be room for two, a new sub-frame was built and a metal hugging Alligator seat fitted for an added layer of cool. Matching the Gator seat is some extra green gear from Biltwell, their colour coded Kung Fu grips slid onto a set of their Moto bars. The classic R series BMW tank finished in black also receives some green in the form of pinstriping that is joined by a thinner inside line in silver. Cleaning the look of the frame up and making it durable the whole thing was coated in hammertone grey that let’s the black and green take centre stage. The BMW is distinctly vintage in its aesthetic, you get the feeling it could be turning up at an MX race in the 1970s and fitting right in; from the blacked out engine and wheels, to the clutter free bars, yellow-lensed headlight and gators on the forks, Craig has done a brilliant job at keeping things custom but period correct. Pulling it all along is the torquey BMW boxer, 745cc of Airhead muscle, that with a long stroke and 2 valves per cylinder provides the perfect basis for an engine required to tow extra weight. The rebuilt and polished carbs provide the fuelling while letting the punters know The Taco Truck is arriving on track are a rorty set of heat wrapped pipes finishing out in their own shorty mufflers. Taking on the suspension duties is a pair of Fox Podium shocks that may seem like overkill on such a build until you consider their need to serve a dual purpose. The fully adjustable remote reservoir shocks mean that the suspension can be perfectly fine tuned for riding with the side car on or with the extra weight removed dialled in for a spirited ride sans plenty of extra baggage. Allowing the BMW to go anywhere are a set of knobby all-purpose Shinko tyres and with that the BMW was done. 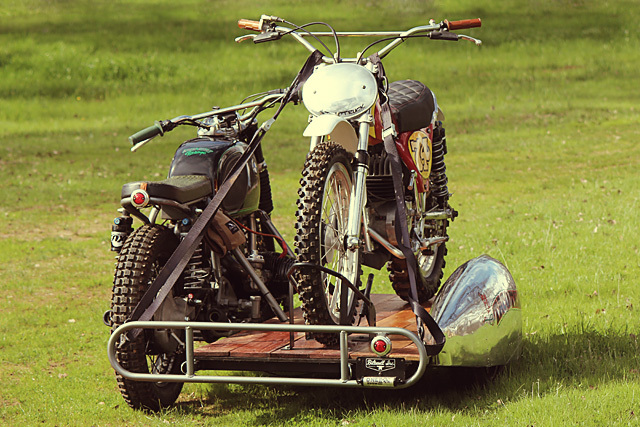 Next up was the sidecar and it is a serious piece of kit given the short time period in which Craig had to work. The frame is fabricated from 2” steel tubing and attaches to the BMW at three points on the frame with pivoting joints. 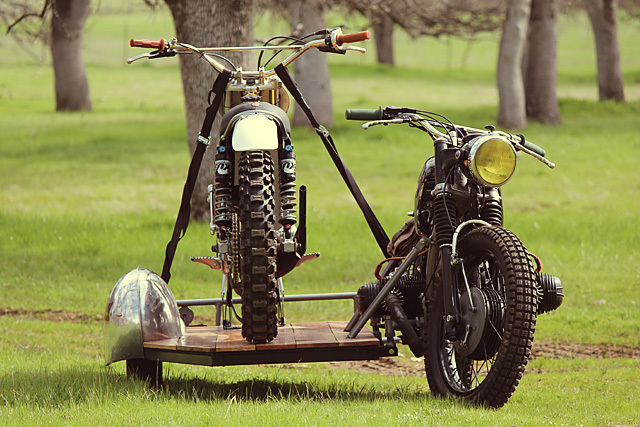 Taking full advantage of the clever construction the side car features a sprung axle and with its own purposeful rubber really can take on all sorts of road conditions. Then it was time for some true hot rod tricks, the flooring is made up of beautiful old redwood planks that give it an old flatbed feel. But the pièce de résistance is the 1940s airplane fender than now covers the wheel. It needed a lot of work before it would fit and be functional but stickered-up with an El Taco Truck logo and left in raw metal it’s an uber cool addition that takes this build to the next level. 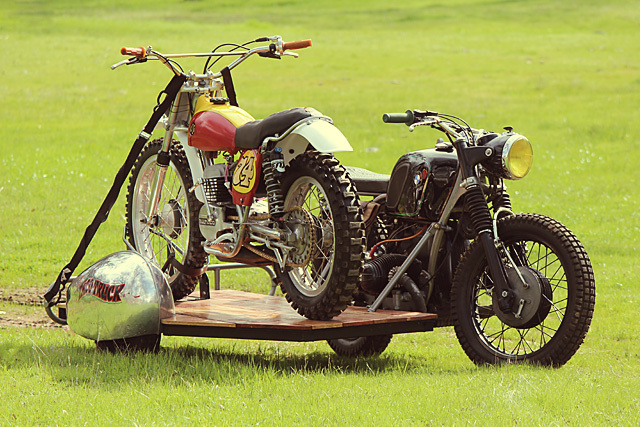 With a custom tow vehicle and sidecar completed it was time for the race bike, a 1973 Bultaco Pursang that belongs to friend of Kick Start, Brook Taplac and was going to be raced by the lads this year anyway. 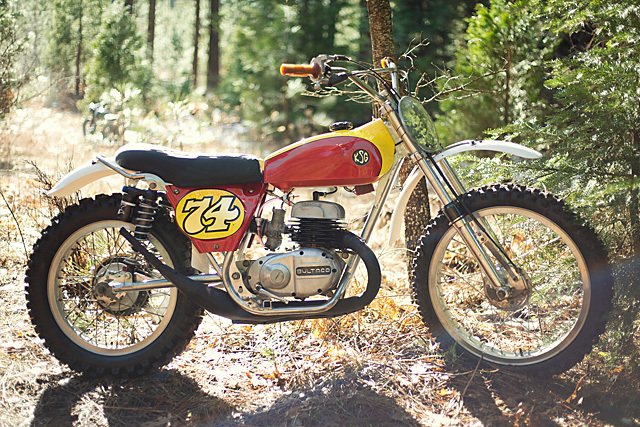 Despite the time factor Craig doesn’t do things by halves and the Bultaco received a good dose of customisation before he deemed it fit to climb aboard the Taco Truck.